Buy your Favorite Mobile or Tablet from Jumia ! Mobiles and Tablets become part of our life. We communicate with the world using these devices. On Jumia, we always work to provide with whatever facilitate people lives. So we created a special category for the best mobiles in egypt, smartphones and tablets. On Jumia.com, you will find the brand you are searching for as we provide a variety of the best brands such as Apple, Samsung, HTC, Lenovo, Asus and more. 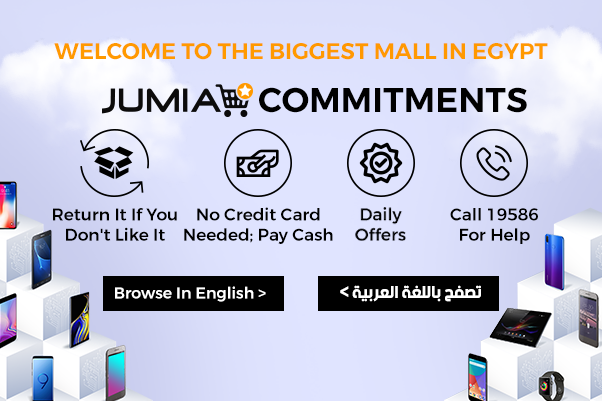 Jumia is like a mobile shop or we can say a mobile shop online, as it saves you the time and efforts you will exert to go the offline stores to buy what you need. Same goes for tablets, if you are a fan of Lenovo tablet, Samsung tablet, dell tablet, Asus tablet or any other kind of tablets, you are going to be amazed by our assortment, prices and specifications! Plus, you can shop sony experia l1, moto e4 plus, P20 Pro, and Smart 2 Pro. In mobiles category, you will find a lot of mobile phones with different prices and specifications to better suit your budget and needs. Mainly, you will find Smartphones and budget phones. If you are a new technology buff, you can choose between different models of smart phones such as dual SIM smart phone, Samsung galaxy, iPhone, Infinix or any other preferred mobile. You can Shop meizu m5, K6 Note, Viwa X1, and P10 Lite at affordable prices. Smartphones facilitate our lives a lot as you can access your email via your phone, you can browse the internet and for sure you can shoot brilliant images with high quality camera. Moreover, you can enjoy a big memory to store all you need in one place. Regarding budget phones, if you are searching for low price phone which you can use for certain purpose, Jumia is your right place! Tablet or iPad? Jumia have both! Whether you are searching for a tablet or Ipad, you will find both on Jumia. Tablets and ipads are very practical for everyday life. You can use it as phones as well if they support calls. Additionally, you can browse the internet while enjoying the bigger screen. Many people prefer to have the tablet to store all movies, games, or any interesting files for them which they can enjoy in travelling, holidays any time. You can find a lot of tablets best brands such as Huawei, Lenovo, Windows, HTC, and many more. Moreover, you can buy your favorite mobile cover or screen protector or any other accessories from our category Mobile and Tablet accessories. You can compare mobiles and tablets on Jumia website to better have an overview about which type will fulfill your needs. You can as well choose the best suitable payment method for you and we deliver your order at your doorstep!